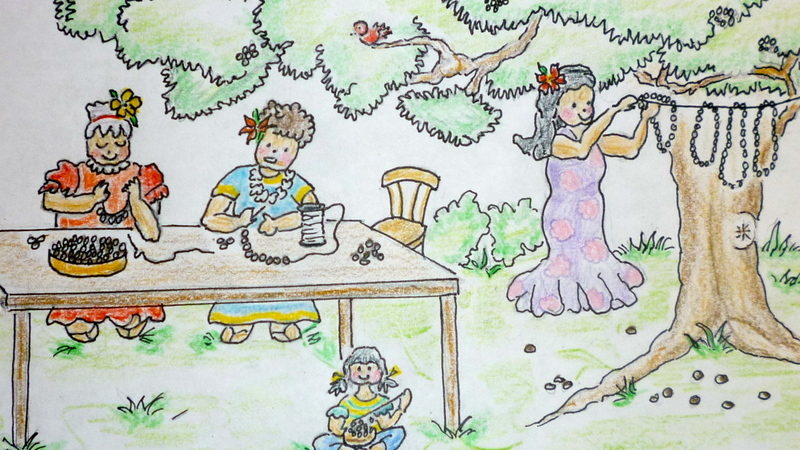 The aunties and tūtū’s (grandmothers) sat happily around the table “talking story” under the protective branches of the Kukui tree stringing its nuts into beautiful necklaces. 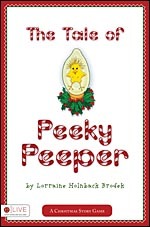 Since the kamali’i (children: “KEH-muh-LEE-‘ee”) were closer to the ground, they eagerly searched for the fallen nuts hidden in the moist grass underneath. The women would teach the stringing technique to the girls who were trusted more with a needle than the boys. 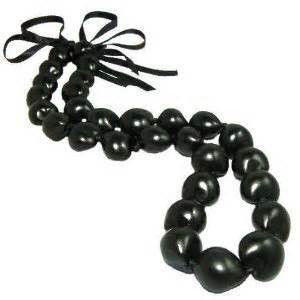 Since it’s all about merchandising, gift shops are pleased to sell you these shiny black or brown “beaded” necklaces to be worn as leis by both men and women. An authentic handmade Kukui nut lei given in the spirit of Aloha is worn with pride and a big happy, smiley face. Since I spark to all things crafty and garden-y, I loved learning about the beautiful Kukui tree from Pi’ilani Lua (“PEE-‘ee-LAH-nee loo-AH”) as we stood under the welcoming shade it provided before she started our tour of the awe-inspiring Kahanu Garden (http://ntbg.org/gardens/kahanu.php). And by-the-by…Uncle Harry Mitchell from Ke’anae (who sadly is no longer with us) used Kukui nuts for his high blood pressure potion. Let’s hope this was not the cause of his passing because daily he would mix one teaspoon of a roasted, ground-up nut kernel…along with garlic juice. If you talked story with Uncle Harry, I bet you had to sit across the Kukui nut table. 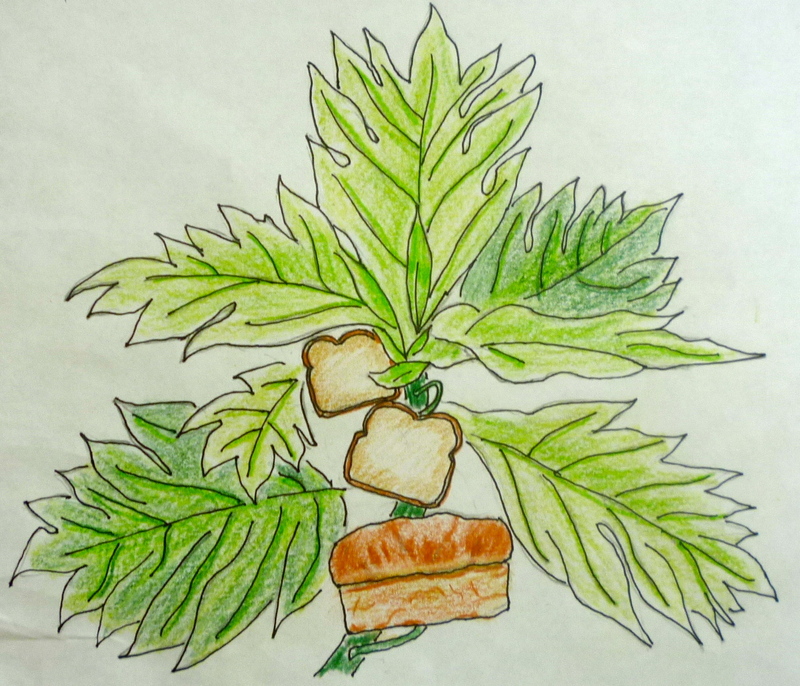 Besides the nuts, the Hawaiians use the tree’s bark and flowers for all sorts of medicinal purposes from constipation to swollen joints. 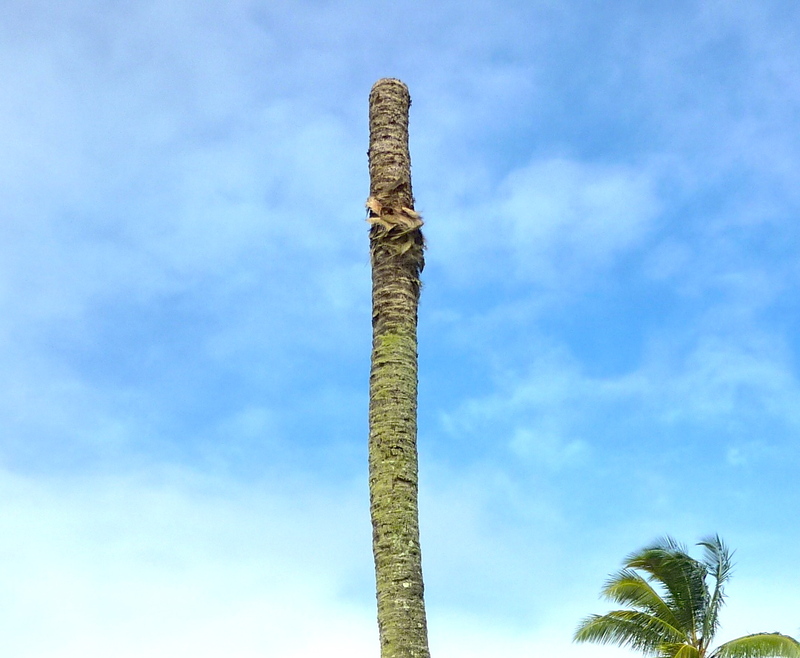 The Kukui is the state tree of Hawaii and is also known as the Candlenut tree. You just shell the nuts, skewer them on a coconut stick, light them and…instant candle (!) or…bonfire if you set the whole tree on fire. 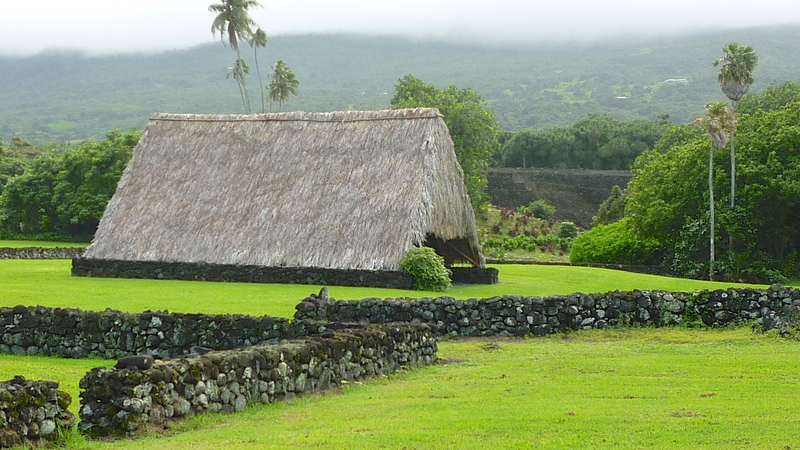 PALM-THATCHED ROOF OF CANOE HALE (HOUSE: “HAH-leh”) WITH THE HEIAU IN THE BACKGROUND. 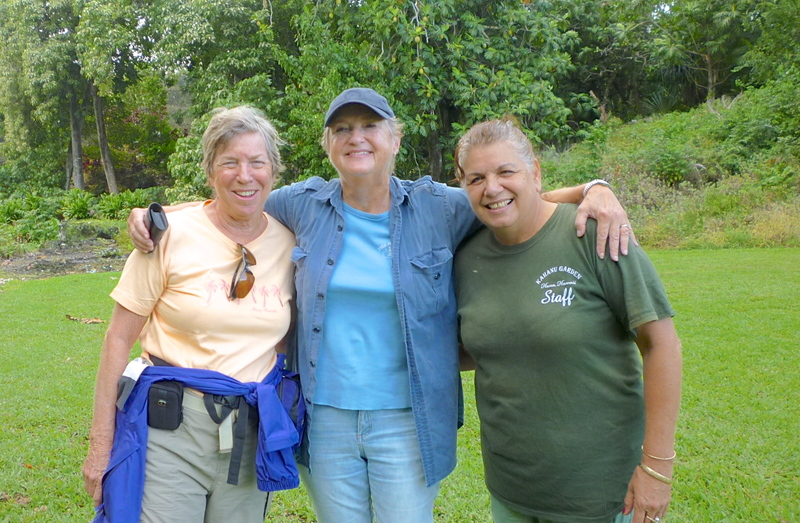 My friend and terrific author, Linda Ballou (lindaballoutalkingtoyou.blogspot.com) also shared this lovely afternoon with me and our wonderful guide Pi’ilani. 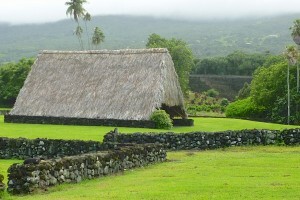 Linda’s interest, based on her book Wai-nani, A Voice from Old Hawai’i, was learning about the magnificent Pi’ilanihale Heiau (“HEH-ee-AH-oo”)…”believed to be the largest ancient place of worship in Polynesia.” All the best stonemasons in Hana completed the restoration and stabilization of this massive lava-rock structure in 1999 after years of the jungle trying to take it over. 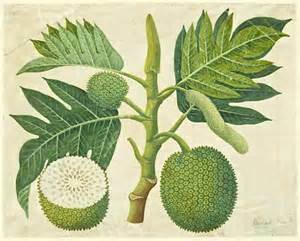 BREADFRUIT…THE REASON THE PILLSBURY DOUGH BOY DOES THE HULA. Another collection in the “world’s largest category” and pride of Kahanu Garden is the rich grove of breadfruit trees. One tree can yield up to 200 grapefruit-sized fruits per season and when ripe can be roasted, baked, fried or boiled…just like a potato which is similar in taste. The best part is that it smells like fresh bread coming out of the oven…thus its name. 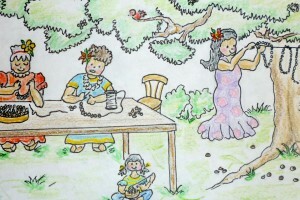 Once again, Hawaiian ancestors have taught families to use almost everything to the max and not to waste a bit of what they grow. The termite resistant wood of the Breadfruit tree is used for building structures and outrigger canoes. Its pulp makes paper (tapa) and its compounds can treat sore eyes and keep those darn mosquitoes away…better than Deet. 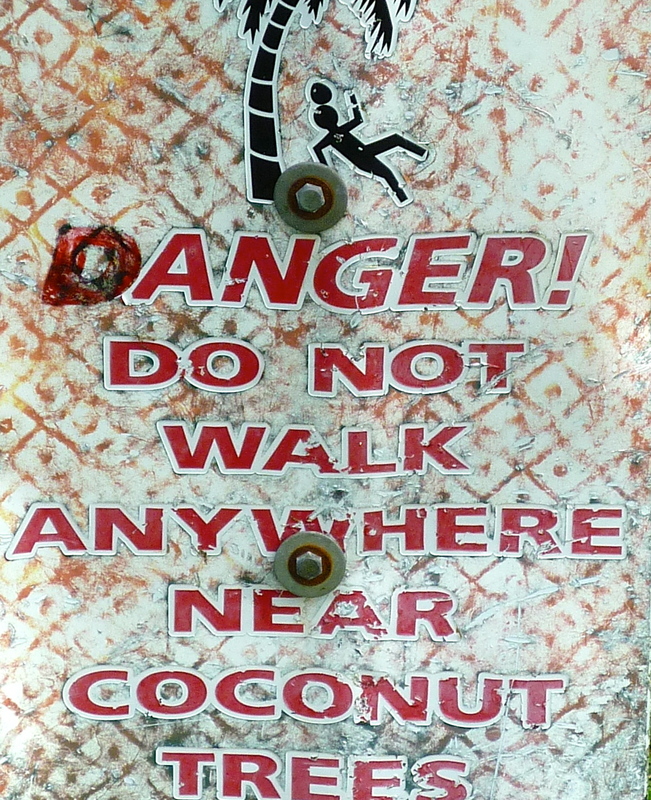 As we wrapped up our tour, Pi’ilani cautioned that we should not walk under the coconut trees. She pointed to a sign: DANGER! 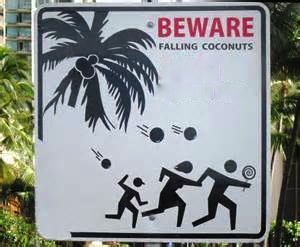 DO NOT WALK ANYWHERE NEAR COCONUT TREES! 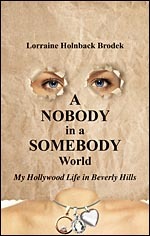 ” That’s because coconut trees can blow their tops?” I questioned. 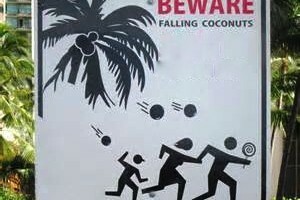 The real reason of course is that falling coconuts can seriously put a dent in your head whereas kukui nuts just bounce off and onto the lei-making table. A SIGN IN ANOTHER GARDEN SHOWS THE TREE TAKING AIM. PLUS A MAN RUNNING WITH A SUCKER?